FILMSPARKS – 50 Years DFFB, written in both German and English, asks fifty filmmakers about the moments in their lives in which a creative awakening – a spark – took place through their encounters with people, films, or art. This book was written on the occasion of the fiftieth anniversary of the Deutschen Film- und Fernsehakademie Berlin (DFFB) and is published by the DFFB. To order the book through email: please send an email to ed.bf1556244092fd@of1556244092ni1556244092 with FILMFUNKE in the subject line. Please indicate the number of books desired and your mailing address. After effectuating the payment, the film book will be shipped. There is a shipping cost of €1.95 per book. *Please note and take into consideration that we will work on international requests individually. To buy the book directly from the DFFB, please visit the DFFB at the Filmhaus in Potsdamer Platz, 9th floor, Monday–Friday, 10 am–12 pm. The DFFB celebrated its fiftieth birthday in September 2016. In 2016 and 2017, we presented a variety of events such as the DFFB Film Festival in the Eiszeit Kino, the major retrospective of DFFB films at the Arsenal cinema, the DFFB sessions, the symposium The Shock of the Real, and the urban cinema series Back on Location. All these events focused on DFFB filmmakers and showcased their work. 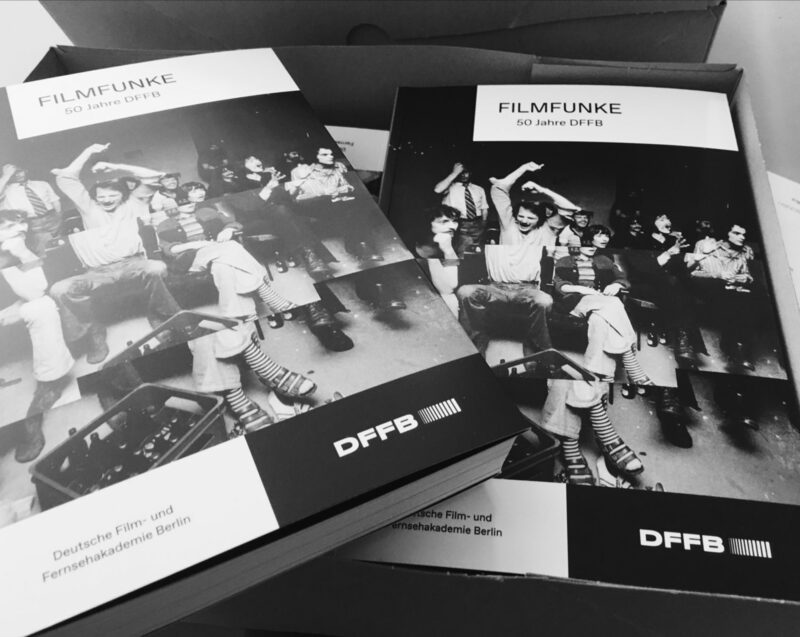 Now, at the end of this period of celebration, we have published FILMSPARKS – 50 Years DFFB, a book, written in both German and English, in which filmmakers, practitioners, theorists, and DFFB alumni and friends share their thoughts on filmmaking and reflect on the history of the DFFB. FILMSPARKS – 50 Years DFFB was made possible through the kind financial support of the Stiftung Deutsche Klassenlotterie Berlin as well as the through the above-mentioned events.